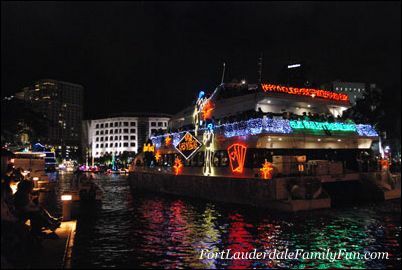 The Winterfest Boat Parade sponsored by the Seminole Hard Rock is probably one of the most attended holiday events in the Fort Lauderdale area. It starts on the river by the Broward Center of the Performing Arts (next to the Las Olas Riverfront) and ending at Lake Santa Barbara in Pompano. Boats are cheerfully decorated for the holidays and illuminated with thousands of colorful lights and float by an enthusiastic yet well-behaved crowd. This is really a highlight of the end of the year and a must-see event! Click here to see the Winterfest Boat Parade route This nautical map from Earth NC is from a previous year's boat parade, but it should remain the same this year and give a general idea of where the boats will be heading. The banks of the New River and the Intracoastal Waterway come alive with hundreds of people. Many boat parade enthusiasts bring their own folding chairs or blankets and claim a spot they deem perfect for boat viewing along the parade route. A few even have small coolers packed with drinks and snacks. 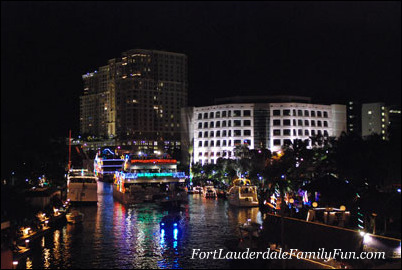 All of them anticipating the more than one hundred decorated floating vessels, from the little boats to gigantic yachts, glide by in one of the most fun outside events in the Fort Lauderdale area. Both commercial and private boats can enter the parade and be judged for how well they present their decorated boat. All the participants always look like they are having a blast. Many in the festive boats have the crew wave and smile at the crowd. Still others, especially some of the larger boats look like they have a whole dance troupe performing for cheering spectators. There are public viewing areas along the way and there is an official grandstand viewing area inside Hugh Taylor Birch State Park on Sunrise Boulevard, near A1A. There is a per person fee. According to the event’s official website, it is one of the top winter parade events in the country. It certainly attracts a lot of attention. Many people from out of town come to Fort Lauderdale to attend the Winterfest Parade. Go to Information and click on Grandstand Seating for rates and more information. The Grandstand is perhaps the best place for public viewing but you’d have to pay to get in. However, seats are assigned plus there is live entertainment and lots of activities for the kids. Food and drinks can also be purchased here. Anywhere along the New River or the Intracoastal Waterway. Check the parade route below by EarthNC to find out where the boats will go. You do need to find your spot early because it can get very crowded. A preferred area seems to be at Riverwalk in downtown Fort Lauderdale. The brick walkways and the nearby Huizenga Plaza is crowded with people happy to be outside. There are usually events going on at the Huizenga Plaza during this time. Booths are set up to sell food and drinks plus there are also activities for children. One year they brought in fake snow! The downside to the Riverwalk and Huizenga Plaza area is that once you go to where the activities are at the park, the boats won't be visible at all. But since not everyone (adults and children alike) will sit through the entire parade, this seems like a good compromise. The EarthNC map tells you where to anchor if you are lucky enough to know someone who has a boat and invites you to view the parade with them. Since this can be a rare treat, most people would be content to hang out by the banks of the river to view the boats glide by and dream. Great reason to have a party, especially if your house, condo or hotel overlooks the parade route. People throw their own boat parade parties or rent hotel rooms with hopes of getting the perfect view of the river or Intracoastal. Haven't experienced this yet but I'm sure it's a lovely sight to see. Staging area starts at the Las Olas Riverfront/Broward Center for the Performing Arts until the Riverside hotel approximately. From here, the boats travel east along the New River then north on the Intracoastal Waterway when it arrives at Bahia Mar. Lasting approximately 2 hours, the parade ends at Lake Santa Barbara in Pompano. EarthNC gives you a nautical map of the path the Winterfest Boat Parade’s takes (this map is from 2009 but the route will pretty much stay the same - it can't really deviate from it because the Intracoastal is really only one path). Use the “hand” tool and you can move the map from left to right and up and down to see where the parade starts and ends. It also shows where spectators can anchor their boat if they are viewing the parade on the water, and what time to get there since the openings close down for the parade. The green line shows you the route the parade will take. Have you been to this boat parade? 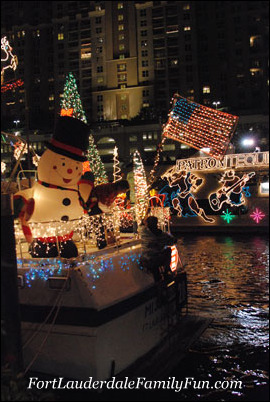 Tell us what you thought about the Winterfest Boat Parade here! What did you see? Did you like it? Was it so-so? What was the best part?